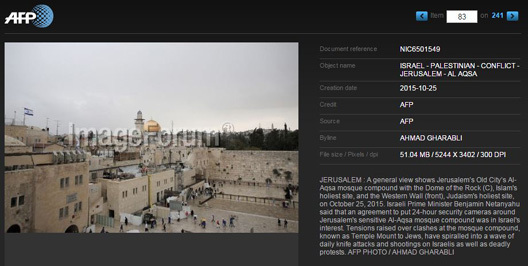 In response to communication from CAMERA’s Israel office, Agence France Presse has quietly corrected photo captions in its archive which incorrectly identified the holiest sites in Islam and Judaism. 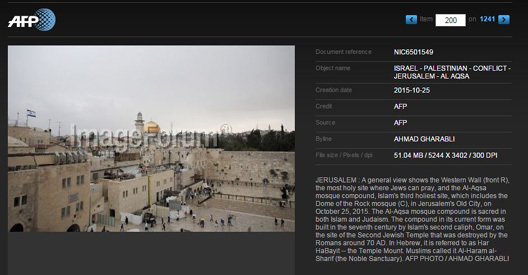 As CAMERA reported yesterday, Oct. 25 photo captions published by the influential news agency misidentified the “Al-Aqsa mosque compound,” also known as the Temple Mount or Noble Sanctuary, as “Islam’s holiest site.” In fact, the al-Aqsa mosque is the third most holy site in Islam. 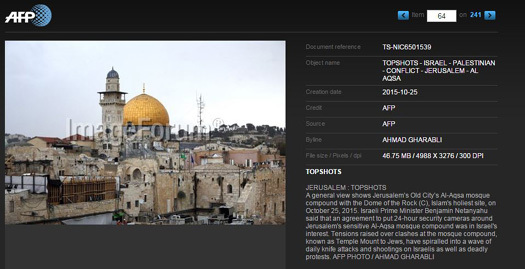 AFP captions also incorrectly identified the Western Wall as Judaism’s holiest site. The Temple Mount is Judaism’s most sacred site. The Western Wall is Judaism’s holiest site where Jewish prayer is permitted. AFP has issued “stealth” corrections to these erroneous captions. In other words, editors changed the captions found in the AFP photo archive but did not alert its subscribers in any way that a correction was made. The corrected captions also includes additional information not noted in the original version, namely that the site is also sacred in Judaism and that the mosque was built in the seventh century on the same spot of the Jewish temple destroyed several centuries earlier. On the down side, the captions still do not note that the Temple Mount is the most sacred site in Judaism.